Today, the kids and I took a little ride along the favourite towpath to the Meeting Point Rest Area, just alongside the Rochdale Canal about 3 miles from home. What Is The “Meeting Point Rest Area”? Basically, a bloke who loves biking (motorbikes, not proper bikes but we’ll let that go for now) has taken a piece of disused, derelict land alongside the canal, opposite the main A58 Rochdale-Halifax road that runs over Blackstone Edge, and put a couple of portakabins on there. He’s put some tables outside and he retails refreshments to passing bikers, cyclists, walkers and even drivers, who can park in a smallish car park right in front. This guy sits in his portakabin with his cute Westie terrier, quietly getting on with his life and providing a wonderful amenity to passers-by. He’s an absolute boon to me, as the girls (aged 7 and 8) love the fact that there are no hills or traffic between our home and the Meeting Point. It’s a cracking, if short, family ride when we have an hour or so to spare. To everyone else, he’s a handy little cafe in a lovely position close to a few busy roads. To some though, he’s a bit of a problem so they’d like to shut him down. The guy has, apparently, been on the wrong end of some complaints. I’m not sure how the planning process works, but apparently his portakabins “aren’t in keeping” with the local architecture. They’re certainly an improvement on the derelict plot they’ve replaced! But, Littleborough’s a nice-looking place with some cracking buildings and I can see how people might see the Rest Area as the thin end of the utilitarian architecture wedge. He’s hoping to put a permanent building on the site I understand, but first he has to await the decision of an independent planning hearing, which takes place in Bristol (why Bristol I wonder? ), probably in December. I hope he wins. It would be a shame to see the place removed. No doubt someone will stick some nice flats on there now he’s levelled and cleared it, but I’d prefer to see the Meeting Point Rest Area made permanent and give the guy a chance to put a nice, appropriate building on the plot. Are there any locals or passers-by reading this blog who have an opinion? Here’s a link to my Google Map. He doesn’t seem to have got a Google Places account yet – I’ll have a word with him about that. You Only Get Wet Once… Off The #Nov100 Mark. Yes. It is in a nice spot. But like you say the building is terrible. Littleborough has to be strict with it’s planning otherwise it’ll end up like Rochdale. And who would visit then? So it would be an investment in the long run to keep to the Town Design Statement. As that is what it is there for after all!! Thanks for the input Jemma. You do have a point, but I think a good compromise would be to allow the venture to stay open in a temporary building, with a timescale put on building an acceptable permanent building. Given that the land was derelict before, the new amenity is (in my opinion) a vast improvement – it gives people a reason to dally along the canal in a beautiful spot without having to be on the way to or from Hollingworth Lake, Todmorden or Halifax. Pingback: How is THIS Better ??! I am raising funds as a community project to get this site used with a rent paying Cafe being on site. 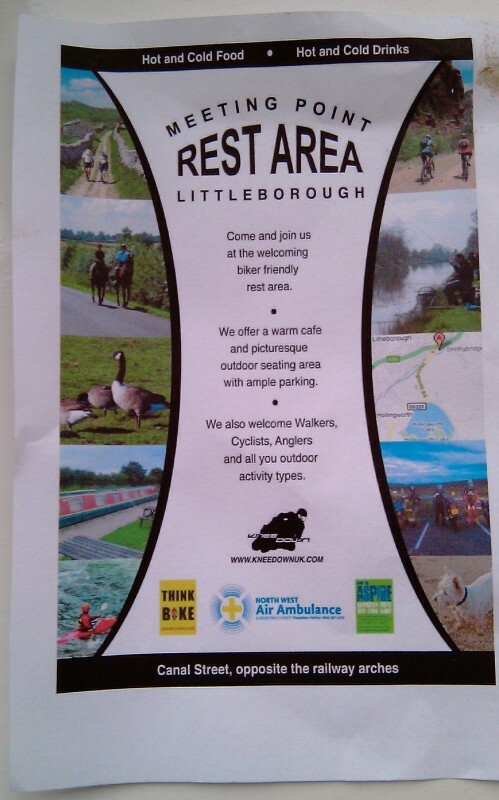 The active website can be found by searching The Littleborough Canalside Cafe. Our JustGiving donation page is linked and so far we have generated in total just £6,000 at the moment. We have costs to cover such as Recognition of name on the internet, Paper, Planning Application Costs etc.